My health club is run by a guy named Angus MacGyver. While I'm sweating away on my home gym, he's running all over the world, building cool gadgets, saving people, and protecting democracy. 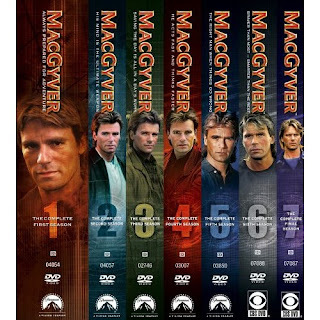 I recently picked up MacGyver - The Complete Series and that's what I've been watching while I work out. I'm almost through the first season. Interesting enough that time on the treadmill (the most boring part of my workout) goes by quickly. Not interesting enough that I stop my workout to watch, or that I can't wait until my next workout to see how an episode ends. Can be listened to during times that I'm facing away or can't conveniently watch the screen. I loved MacGyver when it was originally on and it's still fun to watch. It is what it is. In related news, the Discovery channel show MythBusters recently did a MacGyver episode for their 100th episode, which I watched with my son, who is a big fan. I was sorry to see that some of the tricks just didn't work. You can't blow a hole through a wall with a teaspoon of sodium and water. But, the final part of the show was particularly cool. Adam and Jamie were given a series of MacGyveresque challenges, the last of which was to make something that could signal a helicopter at 100 feet. They were sent to a fake campsite that consisted of a lean-to and all the raw materials to make a potato cannon, along with a bunch of other stuff. They weren't told what to do. They ignored the potatoes and, instead, they used the tarp and structure of the lean-to, plus some rope, to make a 10-foot tall kite. And it worked! The essence of MacGyver at its best. And, in case you were wondering, yes, you can stop a sulfuric acid leak with chocolate candy bars.